This is the remarkable story of a crippled American bomber spared by a German fighter pilot. After the two planes’ pilots had a mid-air moment of understanding, it didn’t seem likely that they’d ever see one another again. Only they did, and became closer than brothers. Brown’s B-17F Flying Fortress, dubbed Ye Olde Pub, was typical of American heavy bombers of the time. Along with an 8,000-pound bomb capacity, the four-engine plane was armed with 11 machine guns and strategically placed armor plating. B-17s cruised at about 27,000 feet, but weren’t pressurized. At that altitude, the air is thin and cold — 60 degrees below zero. Pilots and crew relied upon an onboard oxygen system and really warm flight suits with heated shoes. The drawback to this arrangement was that individual planes couldn’t take evasive maneuvers (they’d risk damage from friendly bombs or machine gun fire), and stragglers were completely open to attack by enemy aircraft. Think about a small group of quick, agile cowboys chasing a herd of buffalo. They’re both dangerous to one another, but if one lumbering buffalo leaves the safety of the group, there’s not much hope for it. Things went from bad to worse for Brown and his crew. Falling behind the formation, Ye Olde Pub weathered merciless attacks from 15 German fighters. The bomber’s machine guns got one of them, but the damage they sustained was immense. The tail gunner was killed and four were injured, including Brown, who caught a bullet fragment in his right shoulder. The only defensive guns left in service were the top turret and the nose gun, and the bomber’s hydraulics and oxygen systems had also been knocked out. The plane went into a spiral, plummeting earthward. On the way out to the sea, Ye Olde Pub passed a German airfield. 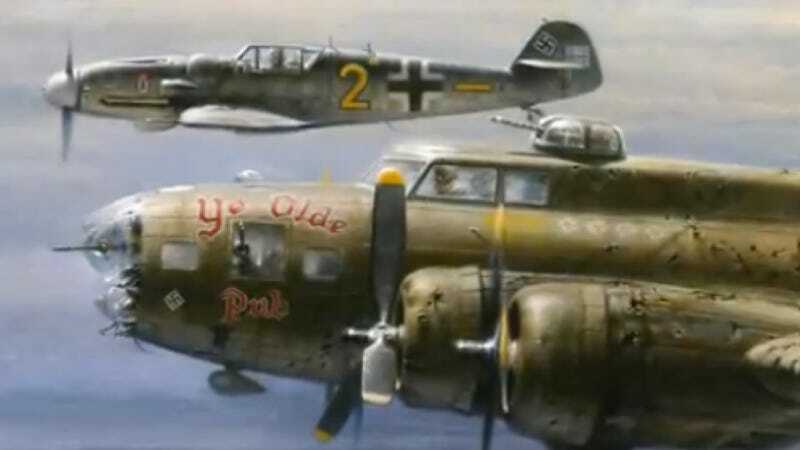 Lt. Franz Stigler, a Luftwaffe fighter pilot just in from shooting down two B-17s, saw Ye Olde Pub limp by. Naturally, he scrambled to give chase. But what he saw arrested any aggression he may have had. As he told interviewers in 1991, he was aghast at the amount of damage the bomber had sustained. Its nose cone was missing, it had several gaping holes in the fuselage. He could see crew members giving first aid to the wounded, and most of the plane’s guns hung limp, unmanned as they were. I saw his gunner lying in the back profusely bleeding….. so, I couldn’t shoot. I tried to get him to land in Germany and he didn’t react at all. So, I figured, well, turn him to Sweden, because his airplane was so shot up; I never saw anything flying so shot up. A bewildered Brown stared back through his side window, not believing what he was seeing. He had already counted himself as a casualty numerous times. But this strange German pilot kept gesturing at him. There was no way he was going to land the plane, but the pilot stayed with him, keeping other attackers off until they reached the North Sea. When it was clear that Brown wasn’t staying in Germany, Stigler saluted, peeled off, and flew out of Ye Olde Pub’s nightmarish day. When Franz tried to get me to surrender, my mind just wouldn’t accept that. It wasn’t chivalry, it wasn’t bravery, it was probably stupidity. My mind just didn’t function in a clear manner. So his choice then was to kill us or try to get us to go to Sweden, since we wouldn’t land. The incredulous debriefing officer, wowed by Brown’s story, went off to tell the brass what had happened. He recommended Brown’s crew for citation, but the glory was short-lived. Brass quickly decided that word getting out about a chivalrous German fighter pilot could endanger the lives of other crews if it caused them to let their guard down. All details of Ye Olde Pub’s first mission were classified Secret. Stigler was never able to speak of his actions that day, as it would have meant certain court martial. He flew many more missions, though, becoming one of the world’s first fighter jet pilots. By the war’s end, he was one of only about 1,300 surviving Luftwaffe pilots. Some 28,000 had served. Stigler finished the war amidst ruin. Anti-Third Reich post-war authorities in Germany were unimpressed with his exemplary service record, and the economy was wrecked. He subsisted on food stamps and work as a bricklayer’s helper for a while, but moved to Canada in 1953. There, he enjoyed success as a businessman. Many years went by without either man ever thinking much about what had happened on that day in 1943. But in 1986, then retired Colonel Charlie Brown was asked to speak at a big combat pilot reunion event called Gathering of the Eagles. Someone asked him if he had any memorable missions during World War II. Brown thought a minute, then dredged up the story of Stigler’s salute which had been buried somewhere in the dirty corners of his mind for decades. Jaws dropped. Brown knew he would have to try to find the man who had spared his life. After four years of searching vainly for U.S. and West German Air Force records that might shed some light on who the pilot was, Brown hadn’t come up with much. So he wrote a letter in a combat pilot association newsletter. A few months later, Brown received a letter from Canada. It was from Stigler. “I was the one,” it said. When they spoke on the phone, Stigler described his plane, the salute; everything Brown needed to hear to know it wasn’t a hoax. http://youtu.be/nNmypZ9lv94 From 1990 to 2008, Charlie Brown and Franz Stigler became like brothers. Introduced by the bond of that first powerful meeting, their friendship was cemented over the years. The two men remained close throughout the rest of their lives, dying within several months of each other in 2008. There are so many parts of that beautiful story that could have turned out differently. In any event, Stigler probably wouldn’t have shot Brown’s crippled plane. He was a veteran pilot with an iron sense of right and wrong; a man who would never kick another while he’s down. But what if Stigler had been executed for his disloyalty? What if Brown had landed in Germany or hadn’t made it across the North Sea? What if Stigler had stayed in Germany and never learned how to speak English? Yes, things could have been different, but that chance encounter in 1943 was destined to become a chance encounter again in 1990. But more importantly, it’s proof to the rest of us that something great done now can change your life much, much later.